Comprehensive fire safety knowledge is paramount and contributes to confidence in handling an emergency situation. With an Australian summer in full swing that is set to have high risk of drought, climate extremes and bushfires, fire training is more important than ever. Correct guidance to extinguish a fire could mean not only the lowering of risks and continued safety of everyone in the building, but could also be the difference between life and death. Summer drastically increases the risk of bushfires. Awareness, knowing what to do when a fire starts, and having the confidence to act quickly could save lives in the home or workplace. Fires escalate very quickly, and a fast response time is integral to reducing overall risk. This means knowing the basics of fire safety and what creates the fire in the first place. 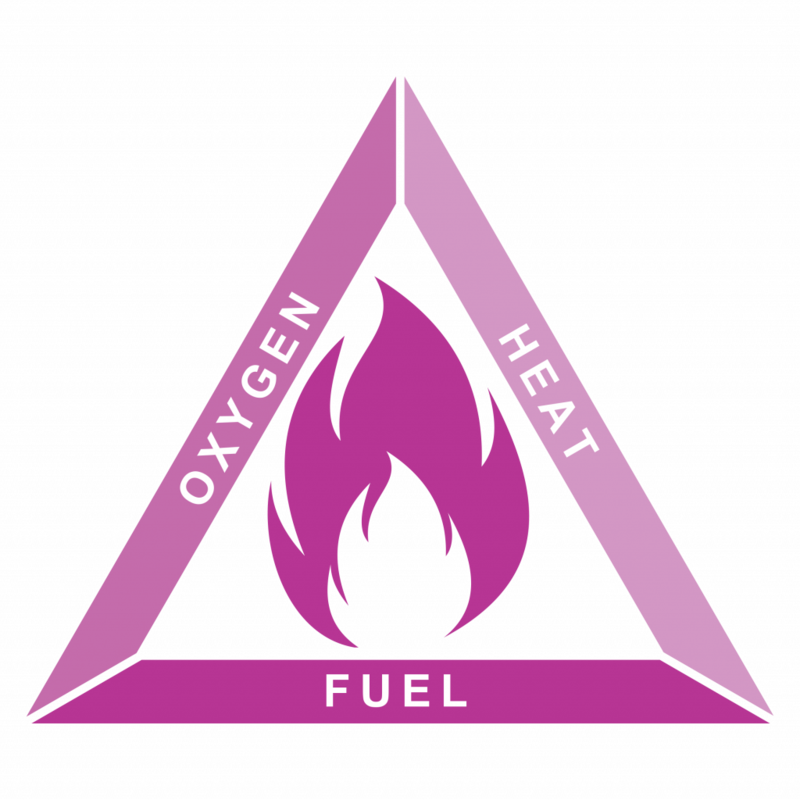 There are different ignition and fuel sources for fires, however they all come back to the Fire Safety Triangle – oxygen, heat and fuel all need to be present. Fires have an overall negative effect on the environment, not only for flames destroying native flora and fauna, but also for potential smoke inhalation and overall air quality. Another major threat to the environment is waste water and residue from larger fires. This runoff can flow into storm water drains and heavily impact local water quality. Warden training is an integral part of encompassing fire safety. The responsibilities of a fire warden include assessing the situation, keeping calm under pressure, leading people out of the building to a designated area, and showing leadership in challenging situations. Staff in the warden’s area should also know about the role, even if they are not designated, so should the designated warden not be in the vicinity, others can step in as needed. 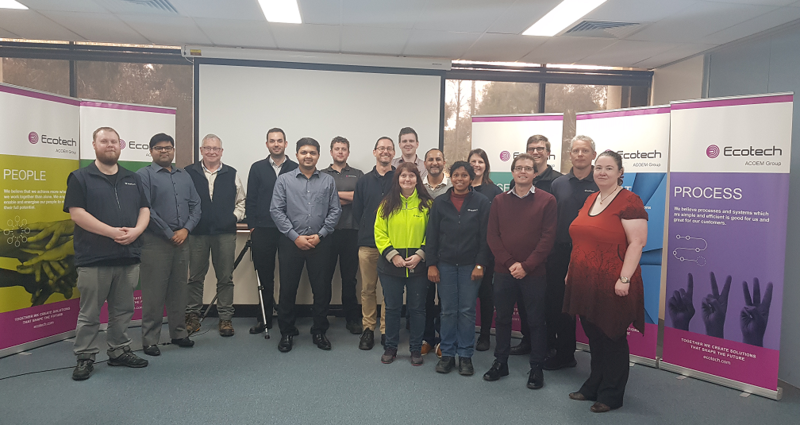 Internal training is run in person at ECOTECH once a year in Australia and India. It is topped up with videos and reading for further education, however face to face is important, as it shows wardens and staff how to use tools at their disposal, such as extinguishers, and get first-hand experience. Getting a feel for using these items, and having a group of people all on the same wavelength increases the chance of a good outcome in case of emergency. 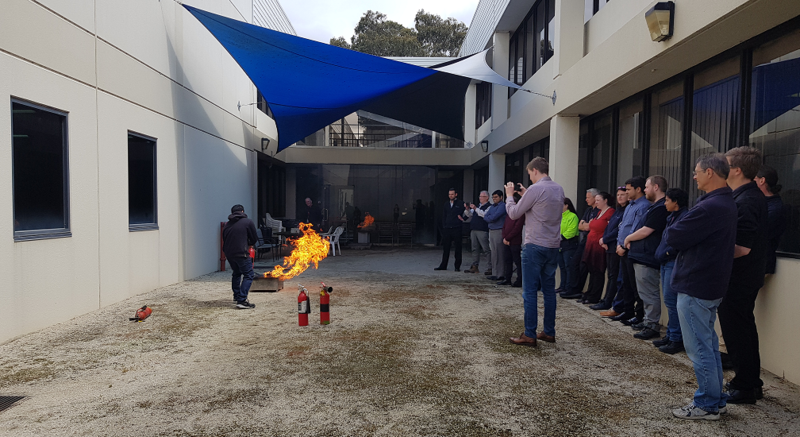 Extinguisher training includes giving a snapshot on what all different types of fires look and act like, and trialling out a CO2 on a real fire. This gives participants real experience on how to handle a situation. Fire drills are an important part of mitigating risk in the workplace. Knowing what to look for and how to identify it is relevant to not only business, but also everyday life, as fires can happen anywhere (e.g. car fire caused by leaking fuel lines). Ignition sources next to fuel sources, such as a powerpoint next to a ream of paper, or even dry grass on a hot day, can set off a powerful blaze if not controlled. Paper (in office environments) and kitchen (appliances out of date or not being tested regularly) are the most commonly occurring fires in the workplace. Electrical fires are also increasing (such as broken or frayed phone chargers). Other significant risks in the workplace include gas bottles and use of old powerpoints that trip out by a spark running through them. However, previously common fires, like the flammable gas type, are decreasing thanks to better technology such as auto shut-off valves. Different extinguishers are used for different fires. Chemical powder is good for almost all fires, except it is corrosive. CO2 carbon dioxide extinguishers are used for electrical fires, and cools and cleans without damaging items. However, selection could be made on urgency and necessity if there are time restraints. 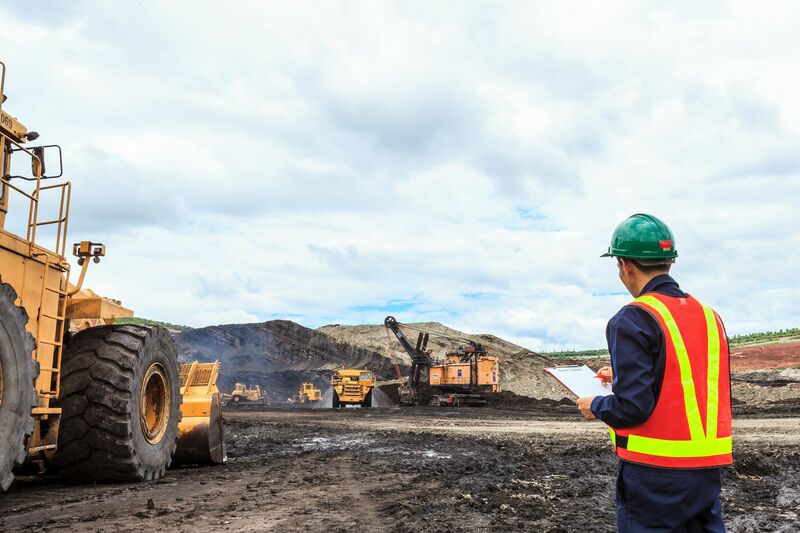 ECOTECH holds Australian Standard General Safety AS 4801.